A weekend off … Last Thursday’s Paisley start for the 2014 Monte Carlo Historic Rally was a big success by all accounts with over 10,000 folk gathering to see off the gathering of ceremonial classic cars plus those who were actually competing on the rally at the start of the Scottish Leg of this international classic. Sadly, I missed it. I was away for the weekend staying in an awfy posh hotel. In fact, it was so posh that none of the four-poster bedrooms had a TV in it. If you wanted to catch up with Top Gear you had to go to the separate TV Lounge or if you wanted to hear the news and weather, the wireless was tuned to Radio 4. 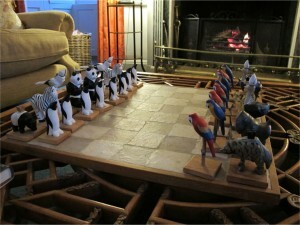 How’s this for a chess set? It was even posher than that. It had another ‘residents lounge’ with a grand piano and a rather unique chess set, plus walls full of unreadable books and reference tomes. As an example of the reading material, there were a few books thoughtfully placed on the bedside table such as John Major’s autobiography, Ffion Hague’s ‘The Pain and the Privilege’ and Andrew Marr’s ‘The Making of Modern Britain’. If those were too lightweight, there was also the choice of ‘Keepers of the Kingdom’ (The Ancient Offices of Britain) with a robed and bewigged high court judge on the cover and ‘Building London’ (the making of a modern metropolis) plus a natty little booklet, ‘How to Master the Times Crossword’. Compulsive reading, eh? However our hosts were hospitably thoughtful and there were a couple of more light hearted volumes to send their readers to slumber such as ‘Potty,Fartwell & Knob’ (true names of British people) by Russell Ash, and ‘The Larry Diaries’, and without a word of a lie this book was all about the life and times of Larry the Cat better known as Number 10’s ratcatcher. Honest, without a word of a lie this was an insight into the daily doings of the Prime Minister’s moggie. Never have I yearned so much for a copy of ‘The Broons’ annual or ‘Oor Wullie’! Did I say it was posh? When I sat down to dinner on Friday night, I had three forks, three knives and two spoons and that was just for the first two courses. They brought more cutlery for the next two! There was a downside. They didn’t plonk the wine bottles down on the table to allow us to serve ourselves. Obviously none of us could be trusted to pour our own without dribbling on the snow-white linen, so a couple of waistcoats and gloves hovered with the red and the white. Me? I thought them a bit tardy at times with the refills, but I managed. This stuff was so good even a wine taster wouldn’t swirl it in his gob and spit it oot. He’d swaally it big time I’m sure. As for the wine itself, even it was so posh the cork turned up it’s nose at me! The occasion was a professional body’s AGM so it wasn’t my personal choice of hosteltry, although I coped manfully with the challenge of appearing posh, using the correct cutlery, sipping wine without slurping and not blowing my nose on the napkin. As for the food. The first course looked like a wine cork till I realised it was a mini-tower of haggis, neep and tattie – note the lack of plurals here. Tiny portions? At first I thought the plate was dirty. Main course was roast beef. I got two slices from an awfy wee coo, the potato was a famine leftover and the veg was blanched. That just means raw. And they didn’t do pudding, as such. It was poached pear in filo pastry (don’t ask Greggs), a teaspoonful of ice cream balanced precariously on a wee round short, shortbread and a saucer of crème fraiche (French custard). Naturally, coffee, seriously mouldy cheese and bisquettes were served in the Music Lounge. Mind you there were a few highlights. The dram of choice when the haggis was piped in and after the meal was Laphroaig. Perfectly acceptable, despite a personal preference for Lagavullin. Anyway, I managed to tolerate it while the lady guests to my left and right passed me theirs for the haggis toast. An ideal start to the repast and banter, eh? It certainly made the room warm and comfortable, or was that the log fire in the marble fireplace? So I had other things on my mind at the weekend. However, I did see that over 300 crews were entered on this year’s Historic Monte Carlo Rally including 18 drivers from the UK and almost as many British co-drivers – some of them were furriners, you see. 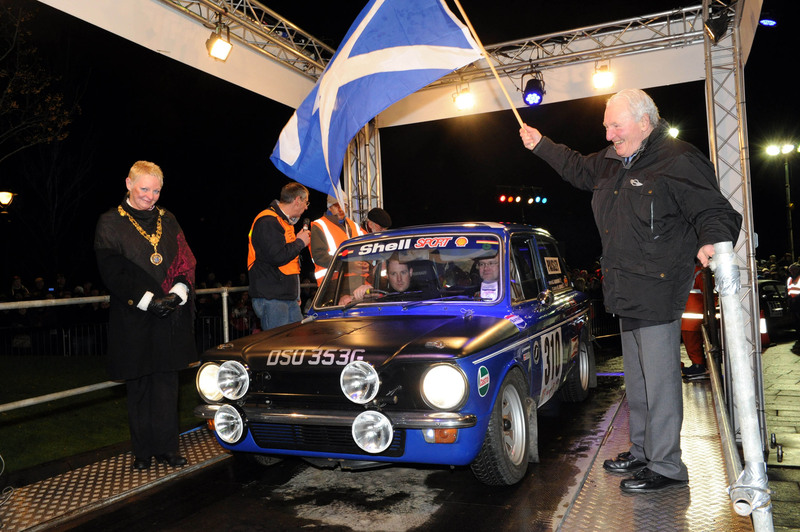 What was particularly pleasing to see was both the 1964 winner Paddy Hopkirk turning up to flag off the cars ably assisted by Rosemary Smith who contested 3 Montes in a British and international rallying career which spanned the 60s and 70s. I am not going to report on the event or the participants, that would be carrying dedication too far, but I couldn’t help noticing that in deference to this year’s 50th anniversary of a Mini winning the Monte outright way back in 1964, there was a Mini ‘seeded’ at Number 1. This in fact was the Morris Mini Cooper S of British pairing, Andrew McAlpine and Fred Gallagher. 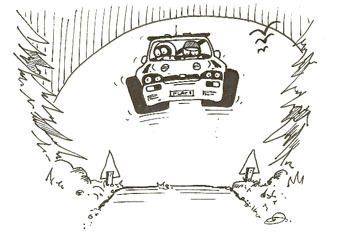 Andrew won’t be terribly well known to most of us as he concentrates on classic rallying these days but Fred is weel kent in the rallying fraternity having sat beside and guided such luminaries in the past as Tony Pond, John Haugland, Henri Toivonen, Juha Kankkunen, Björn Waldegård and Ari Vatanen. However, one wonders how seriously this pair were taking their participation. They didn’t opt for the British start in Paisley. Nope, Barcelona was their chosen start venue. According to Fred: “that gave them the best choice of restaurants on the run to Monaco,” with Fred overheard adding that as he is an FIA Commissioner he does not expect any lateness time penalties to apply to them! Sporting dedication ain’t dead yet, eh? But I missed all that. Somehow a dreich, dark and wet evening in Paisley almost seemed more appealing than my ‘weekend off’ – I said almost!